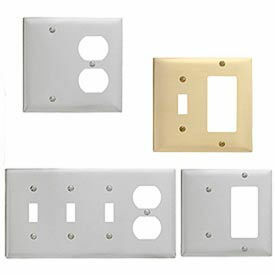 Bryant® Nylon Combination Plates Provide A Single Control Panel For Electrical Outlets & Power Switches. Made of durable, high-impact nylon. Used for schools, hospitals, industrial and other applications where good looks, strength and durability are required. These high-impact nylon plates virtually eliminate breakage losses. Curved corners provide a smooth transition from plate to wall texture. Self-extinguishing, non-conductive material resists oil, grease, solvents and cleaning agents. Reinforcement ribs on rear for extra strength. Captive screws for easy installation. UL listed. CSA certified. 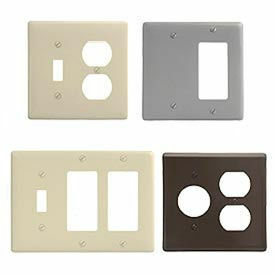 Bryant® Combination Plates Help Create A Single Control Source For Multiple Outlets & Switches. 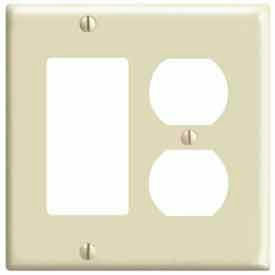 Wall plates are elegant enough for the home and tough enough to withstand the most rigorous environments. 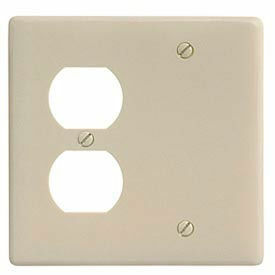 Nylon wall plates are virtually unbreakable and easy to clean. Curved corners provide a smooth transition from plate to wall texture. Reinforcement ribs on rear for extra strength. Captive screws for easy installation. UL listed. CSA certified. Leviton® Decora® Combination Wall Plates Provide Space For Combining Decora-Style And Toggle-Style Switches On One Switchplate. Leviton® Decora® Combination Wall Plates provide a combination of decora-style, receptacle-style or toggle-style openings on the same plate. Plates are made using thermoset plastic for lasting durability. Smoothe face and rounded edges resist dust accumulation. Thermoset offers high dielectric strength and arc resistance. Available in a variety of sizes and combinations. Choose from several colors. 2 Year Limited Warranty.